This city was thrown into a great state of excitement to-day, by the assassination of Mr. King. Mr. King did not draw any weapon, but was met in the middle of the street by Casey, who said, "Are you armed? 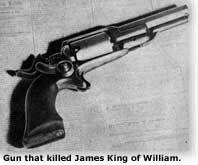 " to which Mr. King made no reply but looked at Casey. Casey threw off his cloak and presented a large navy revolver saying"Draw and defend yourself," at the same time taking deliberate aim and covering his victim with a well directed shot, the result of which is known. He then cocked the pistol again, but seeing his opponent stagger into the Pacific Express office, did not attempt a second shot; some person caught hold of him and told him to give up his arms, which, he refused, and showed fight; but on approach of two or three officers, he remarked that he would go, but they must not take his arms, as he was not going to be hung. The horrible and heart-rending occurrence, the shooting down of Mr. King in broad daylight, in the public street, has justly aroused the indignation of the entire community. THE CAPTURE FROM JAIL, MAY 15TH. The Executive Committee was formed into a solid square of about ten deep, directly in front of the jail, and the "Citizen's Guard" formed a hollow square about them, and all appeared ready for action. A deputation of the Committee was delegated to call at the door and request the Sheriff to place them in possession of the prisoner, Casey. Without any hesitation the Sheriff repaired to the cell of the prisoner and informed him that the Vigilance Committee were waiting at the door and demanded his person, and that he was compelled to yield it up. Long before the hour fixed for the ceremonies at the church, Stockton street was literally thronged by men, women and children, almost blocking up the street, from Washington to California street. At the conclusion of the church services, the most imposing procession we ever witnessed in California, was formed, and followed the remains to Lone Mountain Cemetery. The procession moved along Stockton street to Washington, thence down to Montgomery, thence to Bush and up Bush to the Lone Mountain Cemetery. the time occupied in passing a point while in Montgomery street, was thirty-five minutes. When the past portion of the procession left the corner of Stockton and California streets, its front had reached the corner of Dupont and Bush, a distance of about one mile. EXECUTION OF CASEY AND CORA. While the last tokens of respect were being paid to the memory of Mr. King, at the church, a very different proceeding was going on at the Rooms of the Vigilance Committee. Notwithstanding the great gathering at the funeral, the rooms of the Committee were surrounded by about 20,000 people, who had got an intimation of the proposed execution, and hurried to the spot. The most formidable guard was arranged, which embraced all the arms of the Committee, consisting of about 3,000 stand of muskets and two field pieces. The streets in the immediate vicinity of the rooms were cleared by the soldiers, and the bristling bayonets that were displayed in every direction, made the scene one of great solemnity. One of the field pieces was planted so as to command Davis street from Sacramento street, and the other so as to command Front street. At 20 minutes past one o'clock every thing being ready to carry out the designs of the executioners, the signal was given and the cord that held up the outer end of the scaffolds, or platforms, was cut upon the roof of the building, and the doomed men were both launched into eternity. During this solemn and awful ceremony a perfect stillness and silence was observed by the vast throng who were spectators at the scene.